Rust College, a United Methodist Church–supported institution located in Holly Springs and the first historically black college founded in Mississippi, was organized in 1866 through the efforts of former slave Rev. Moses Adams and white clergyman Albert Collier McDonald of the Methodist Episcopal Church, North. Originally started as a church school at Asbury Methodist Church, where Adams was pastor, the school was chartered as Shaw University in 1870, with McDonald serving as its first president. The school took its name from Rev. S. P. Shaw, who contributed ten thousand dollars toward building the institution. During Reconstruction Shaw students served as a base for Republican political support in Marshall County and offered former slaves not only an education but also a community institution from which they could forward the cause of racial equality. Ida B. Wells attended Shaw University during the 1870s and later became a well-known journalist and anti-lynching crusader. Renamed Rust University in 1890 after Rev. Richard S. Rust, the school trained students to serve as teachers, activists, professionals, and business leaders, and its graduates spread across the United States. After receiving a degree from the school in 1886, Matthew Dogan became a teacher and ultimately the president of Wiley College, a historically black institution in Texas. During the 1890s businessman and entrepreneur Charles Banks briefly attended Rust before opening a bank and an oil factory in Mound Bayou. Perry Howard, an 1899 Rust graduate, became an assistant US attorney general during the administration of Warren G. Harding. 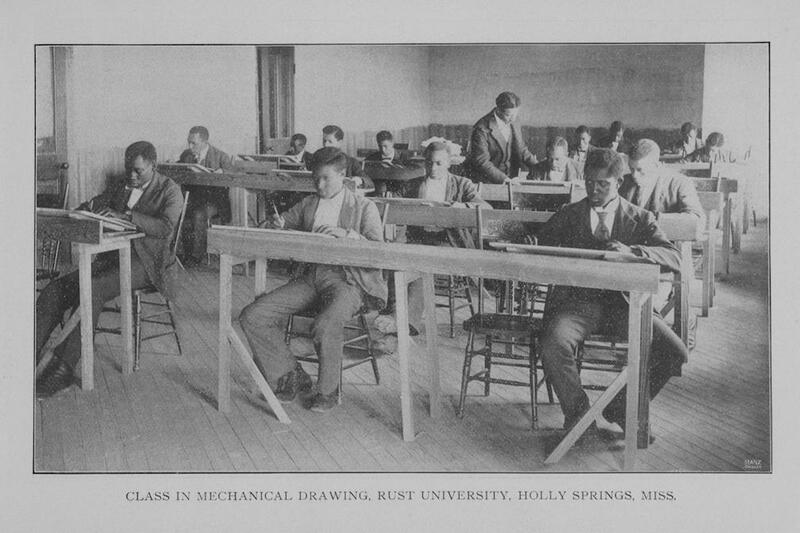 In 1914 the Education Board of the Methodist Episcopal Church renamed the school Rust College. Eighty-two Rust students saw action in World War I. In 1920 Dr. Matthew Davage became the school’s first African American president. He was succeeded in 1924 by Lee Marcus McCoy, a 1905 Rust graduate who was instrumental in keeping the college open during the Great Depression. Under the direction of Natalie Doxey, the Rust Singers toured the Midwest to raise funds for the college, and McCoy organized a campus farm and a fruit canning factory to provide additional income. McCoy’s self-help projects and promotion of academic excellence brought Rust College through the economic crisis. In 1957 Earnest A. Smith took on the task of leading Rust College. Smith’s administration played a significant role in promoting racial cooperation and ending segregation of public facilities in Marshall County. Though he came under fire from local white political leaders, he did not discourage Rust students from promoting voter registration, and he backed the efforts of civil rights organizations operating in Holly Springs. He opened Rust’s doors to Student Nonviolent Coordinating Committee workers and allowed James Meredith, the first African American student to attend the University of Mississippi, to stay at Rust on weekends. William A. McMillan succeeded Smith in 1967 and oversaw Rust College’s accreditation by the Southern Association of Colleges and Universities. McMillan’s tenure also witnessed a campus construction boom that included a new gymnasium and mass communication and social science facilities. What McMillan called the school’s “upward thrust towards excellence” prepared Rust College for the twenty-first century. After McMillan’s 1993 retirement, Rust graduate David Beckley assumed the presidency. Under Beckley’s leadership Rust expanded its academic goals and facilities and maintained its accreditation. A new science building opened in 2008, and Rust College inaugurated the Families First Center, a campus social services agency that works closely with local government agencies to address problems faced by local families. Rust College continues to promote excellence in higher education as one of Mississippi’s premier private liberal arts colleges.